Not long ago, in pop culture discussions happening not so far away, the label “Strong Female Character” (SFC) became a term. Despite the fact that it mainly is the opposite of the damsel in distress trope frequently used in films over and over again in the past centuries, the SFC is used to optimize not only the female but also -and as it seems mostly- the male audience, by often taking the role of a sexually attractive femme fatal. Writers created these potentially fantastic, strong women in fantasy, sci-fi, action and horror stories, but their characters ended up either missing the mark completely or worse, coming frustratingly close. And so, the term SFC became a derogatory one. These one-dimensional superheroines exist merely simply to motivate the male protagonist in their stories. It is rare to find a female character who is distinct, complex and progresses the story in ways outside of being an ‘eye-candy’ for the male audience and/or an object for the male protagonist to gain, by always making him seem more heroic and manly. In recent years, however, there has been a paradigm shift regarding the status of female characters in movies, With films like “Mad Max: Fury Road” and Imperator Furiosa, a superheroine who beats out her male counterpart at the box office, or “Wonder Woman” the beloved Amazon created by Dr.William Moulton Marston-Harry Peter in 1941, this trope seems to finally come to an end. This is a big moment for pop-culture connoisseurs who have been thirsting for a truly strong, female character. For women who’ve felt underrepresented through decades, where most of the ladies onscreen were victims or tokens, it is natural to feel some kind of fulfillment. It’s especially thrilling to see a beautifully written, fierce female character, who defies the usual and boring tropes reserved for female characters in the newest Star Wars trilogy. The Star Wars movies by default had always strong male protagonists, so a female lead is certainly a welcome change. Although some argue that Princess Leia was a feminist icon back in the 70’s, she lacked authority, she wasn’t the protagonist and she never sat in the pilot’s seat. 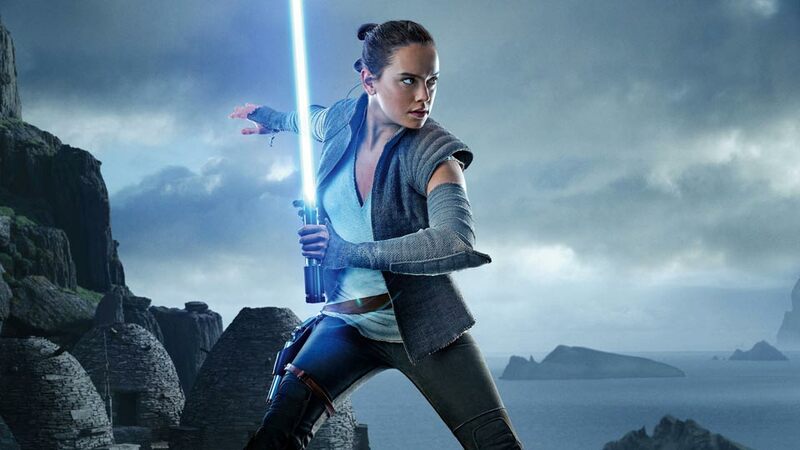 She is a strong and empowered heroine, no doubt, and we definitely love her but Rey’s character is even more important: we never see her in a revealing bikini that only exists to appeal to the male audience and without the privileges of having a royal title, she is marching the way towards placing more women in superhero roles. Rey is a truly cathartic character. Her hero- journey from lonely orphan living in the wastelands of Jaku to badass pilot and fighter is emotional and full of conflict. She never doubts herself though often the dark side calls to her, and the scenes of her flying the Millennium Falcon are, at least, empowering. The dialogue between her and Han Solo finally provides the feminist moment we’ve all been waiting for. She is defined by what we are all hungry for, her power is derived from merit, she is the best fighter, the best pilot, the natural leader. As she prepares to fight scores of Storm Troopers Han hands her a weapon. “You might need this,” he says. She replies: “I think I can handle myself,” and he answers: “That’s why I’m giving it to you.” It really sets the tone of the film. She never needs to be saved, like we are used to seeing in the damsel in distress trope, as she always saves herself. Although it could easily be a movie about Kylo Ren, the anti-hero and a man with great inner conflict and great character progression, the writers made it clear that ‘The Last Jedi” is all about Rey. In the scene where Rey is taken to be confronted by Snoke, the lightsaber doesn’t go into the hands of Ren, but in Rey’s. And while “The Force Awakens” and “The Last Jedi” netted positive reviews, Rey’s character was not without criticism from some fans, who criticized her for being “too perfect”. We see Rey fly starships, naturally, use the force, and repair the Millennium Falcon. Rey’s undoubtedly talented at many things, which has some fans calling her a “Mary Sue,” fandom’s terminology for a character in fiction who is unrealistically perfect. In the grand sexist tradition of female characters being under greater criticism than male characters, some fans think it’s suspicious for Rey to be so capable. Daisy Ridley rightly pointed out in an interview that Luke is depicted as similarly competent and doesn’t get scrutinized the same way. Luke also had a natural talent with the force, and with little training by Yoda became a master and defeated the almighty Darth Vader , just because “the force was strong with this one”. Like so, Rey has a gift, a raw power and with little help from her teacher Luke, she learns to control it better and becomes somewhat of an expert. She is the equivalent of Luke Skywalker but in a different body defined by her gender. Whatever the fans say, or the reviews are, the point remains the same: with Rey’s swashbuckling character, women, at last, get to be the heroes, the protagonists. For generations, women have been expected to empathize with characters who don’t look like them. And as long as the hero-journey proves to be at least gender neutral, hopefully, Hollywood will continue to produce well-written superheroines, who are strong and can empower women, breaking the myth that women and sci-fi (or superhero) movies do not mix.